The identification of a person requires the comparison of his/her fingerprint with all the fingerprints in a database, which in large scale applications may be very large (several million fingerprints). A common strategy to reduce the number of comparisons during fingerprint retrieval and, consequently, to improve the response time of the identification process, is to divide the fingerprints into some predefined classes. Fingerprint classification means assigning each fingerprint to a class in a consistent and reliable way, such that an unknown fingerprint to be searched, needs to be compared only with the subset of fingerprints in the database belonging to the same class. While fingerprint matching is usually performed according to fingerprint micro-features, such as ridge terminations and bifurcations (minutiae), fingerprint classification is usually based on macro-features, such as global ridge structure. All the classification schemes currently used by police agencies are variants of the so-called Henry�s classification scheme. 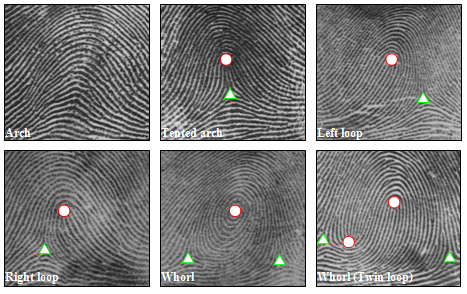 Five classes (Arch, Tented arch, Left loop, Right loop and Whorl) are commonly used by today�s fingerprint classification techniques. In reality, fingerprints are not uniformly distributed among these five classes: the proportions have been estimated as 3.7%, 2.9%, 33.8%, 31.7% and 27.9% for Arch, Tented arch, Left loop, Right loop and Whorl, respectively.